Fenerbahce won 11 games in the Top 16, but found many different ways to get those wins. For example, it recorded the club’s biggest road win in more than a decade when it blew out Crvena Zvezda Telekom Belgrade 65-88 at Hala Pionir, one of the toughest road venues on the continent. Fenerbahce also won with the most and least total points in games this season, both of which came on the road, too. Coach Zeljko Obradovic’s men scored the second-most points in club history to beat Darussafaka Dogus Istanbul 100-106, whose total of 206 points is tied for the most scored in a single game this season. On the other hand, Fener edged Lokomotiv Kuban Krasnodar 52-55, which was the lowest-scoring game of the season and the second-fewest points a team scored to win a game in the Turkish Airlines Euroleague this decade. Fenerbahce trailed by a point entering the final minute of that contest, but that was only one of its come-from-behind wins in this Top 16. As a matter of fact, Fenerbahce trailed at some point in the second half in six of its Top 16 victories, and each of those games was decided by 7 points or less. It also trailed on the road against rival Anadolu Efes Istanbul 54-45 with three minutes to go in the third quarter, while on home floor Fenerbahce trailed in the second half of four Top 16 games it went on to win. Fenerbahce was down 53-62 with eight minutes to go against Lokomotiv and trailed by 10 early in the third quarter against Crvena Zvezda Telekom Belgrade. A chapter in Madrid's storied history is headlined by Coach Zeljko Obradovic, who led the club from the Spanish capital to the Euroleague title in 1995. That was the eighth continental crown for Madrid, and the third title as a coach for Obradovic, who later won five more Euroleague crowns with Panathinaikos. He also coached Real Madrid to the 1997 Saporta Cup trophy with current Madrid head coach Pablo Laso as the point guard on that team. Since then, Obradovic has led Benetton Treviso, Panathinaikos and Fenerbahce, and has faced Madrid 15 times. Obradovic teams hold an 8-7 record in those games, but have only one win over Madrid in the last six games. That one came this regular season when Fenerbahce beat Madrid on its home floor 77-66 behind 15 points apiece from Ekpe Udoh and Luigi Datome. 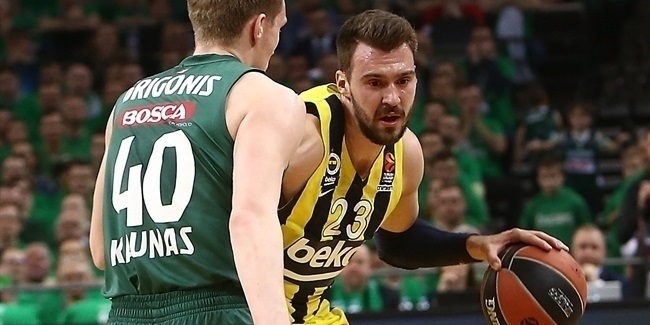 This series is a rematch of last year's Final Four semifinals, which Madrid won 96-87, but a lot will be different in this playoff series, especially for Fenerbahce, since it has only two players on the roster that played in that game and will participate in this series: shooting guards Bogdan Bogdanovic and Melih Mahmutoglu. Center Jan Vesely will miss this series with Achilles injury, and point guard Ricky Hickman was with Fenerbahce last year, but sidelined with an Achilles injury of his own. For the defending champions, nine players remain – Sergio Llull, Sergio Rodriguez, Rudy Fernandez, Felipe Reyes, Jaycee Carroll, Gustavo Ayon, Andres Nocioni, Jonas Maciulis and K.C. Rivers. Those players combined to score 93 of 96 Madrid’s points in that game, and two days later went on to lift the Euroleague title. No team has taken care of the ball as well as Real Madrid over the last four years. It is a team that set a Euroleague record for the fewest turnovers in a single game when it had only 2 in 2014 against CSKA Moscow, and Madrid is the team with fewest turnovers in the Top 16 in each of the last three seasons. This season it continued down the same road, committing the fewest (10.6 per game) in the Top 16. Madrid has also been among the assist-to-turnover ratio leaders in each of the last three seasons, including this season when team dished 1.7 assists for each turnover it committed. Such efficiency starts with Madrid’s backcourt of Sergio Llull and former MVP Sergio Rodriguez, who top the assist-to-turnover rankings for the second year in a row – Llull is first (3.29 assist-per-turnover) and Rodriguez second (3.22). Cutting down on turnovers is one of the keys to playoff success. Over the past three years, the teams that in the playoffs ranked first (Real Madrid in 2015) or second (Olympiacos in 2013 and Maccabi Tel Aviv in 2014) in assist-to-turnover ratio, went on to win the titles. 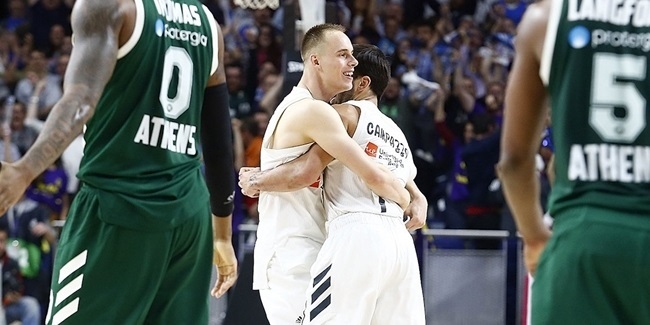 The Euroleague history books are filled with feats accomplished by Real Madrid players and there will likely be more mentions when this series ends, regardless of how it turns out. Both Felipe Reyes and Sergio Llull are in position to soar up the list of playoff scorers; Reyes enters the series sixth all-time with 269 points and Llull trails by just 2 points. In fifth place they can overtake Jaka Lakovic (270 points) and Olympiacos forward Georgios Printezis (279 points) is catchable too in fourth place. 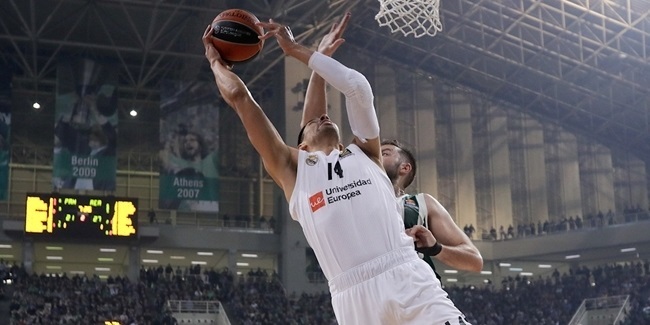 Third place is less likely this season, since it belongs to Panathinaikos Athens playmaker Dimitris Diamantidis (303), who is active in the playoffs. Reyes also enters the playoffs needing 19 points to catch Nikola Vujcic (2,444 points) for seventh place on the Euroleague’s career scoring charts, while Llull is 40 points away from becoming the 20th player in Euroleague history with 2,000 career points. And Llull needs 8 more three-pointers to reach the milestone of 300 in his Euroleague career, which only 10 players have accomplished to date. But they are not the only players moving on up. Sergio Rodriguez is 5 assists behind Zalgiris Kaunas coach Sarunas Jaseikevicius (755 assists) for sixth place on the Euroleague’s career charts. Rudy Fernandez needs 5 more steals to move into the Euroleague’s career top 20. And Andres Nocioni needs 4 more steals to reach 100 for his Euroleague career, which would put him in exclusive company as the fifth player to rack up at least 100 three-pointers, blocked shots and steals in the Euroleague. Despite having an offense that ranked second in scoring (84.5 ppg. ), assists (19.9 apg.) and three-pointers made (235) this season, no Madrid player scored more than 24 points in a game, which Gustavo Ayon accomplished in a Top 16 road win at Khimki Moscow Region and Felipe Reyes in a home win against Zalgiris Kaunas. However, Madrid allowed seven different opposing players in five different games to score 24 points or more, which is more than any other playoff team. In those games, Madrid had a 1-4 record, with the lone win coming in the do-or-die Top 16 finale, at home against Khimki. On the other hand, Fenerbahce saw its players score 24 points or more four times, and never allowed an opposing player to score more than 22 points this season. Moreover, throughout the course of the season, Real Madrid registered as many wins, 12, as losses. In those dozen defeats, Madrid scored more than 80 points eight times, and averaged 79.3 points in games it lost, but allowed opponents to beat it with an average of 87.3 points, which is second-highest in the competition. In games won, only CSKA averages better than Madrid’s 89.7 points this season.